Some 30 officers from the Spanish National Police are due to testify as witnesses in week 9 of the trial of Catalan independence leaders in Spain’s Supreme Court. However on Tuesday, the 28th day of the trial, first to declare were Guardia Civil officers involved in a number of operations around Catalonia, but whose testimony was held over from last week’s sessions. Catalan Trial: click here full details of those accused, the charges, and the accusers. The first Guardia Civil officer testifying on Tuesday was involved in operations in the town of Sant Carles de la Ràpita, and claimed that voters ‘threw stones’ at police. The following officer was stationed in Vilabella for the referendum day, and he told the court of ‘kicks’, ‘spitting’ and ‘pushing’ by voters. The third officer to take the stand said that in Mont-roig del Camp on referendum day his finger was injured, for which he had to undergo surgery. Following them will be officers from Spain’s National police, including those in charge of drawing up reports on police operations in Barcelona and other cities, such as L’Hospitalet de Llobregat and Sabadell. Some Catalan officers are also due to testify this week, including the head of a regional unit of the Mossos d’Esquadra, Jordi Rodon, who is due to declare on Wednesday morning. He will be followed on the stand by six other members of the Catalan police, as well as five local police officers from the city of Badalona. 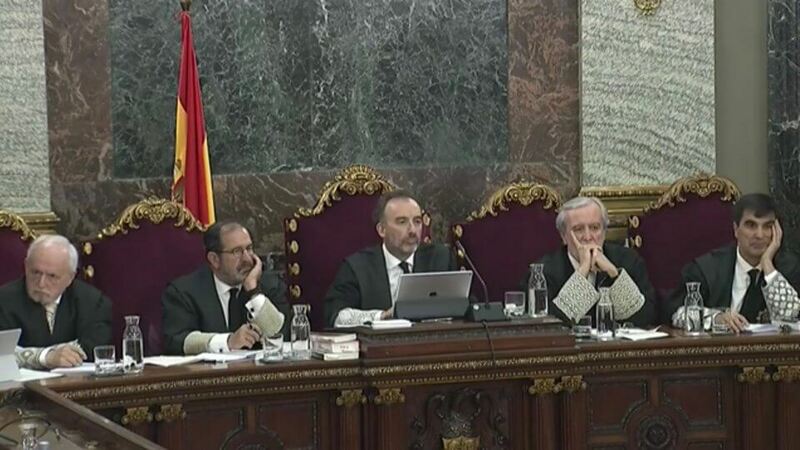 In parallel to the session, the Supreme Court has to decide on whether the imprisoned Catalan leaders running in the Spanish general election should be released for the duration of the campaign. 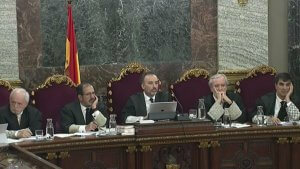 The vote is on 28 April, with Oriol Junqueras, Raül Romeva, Jordi Turull, Josep Rull and Jordi Sànchez all taking part while facing charges in the Catalan trial. The Supreme Court has decided it will leave the question of holding election debates in prison up to the Spanish Electoral Authority. Jailed activist and MP Jordi Sànchez made the request to the Supreme Court to hold debates in the prison he’s being held in while the Catalan trial is ongoing, but the judges are leaving the final call to the Electoral Authority. Sànchez is being held in Madrid’s Soto del Real prison, along with Oriol Junqueras, who has also requested permission to hold election rallies in the penitentiary facility.